I don't get angry easily. I don't get offended easily. I am very likely not to notice people being snide. If someone comments on my parenting (ie, should your baby be putting that in her mouth? Your daughter is climbing up the down slide. . .) I don't usually get upset but I generally say something like, "Yeah, that's okay, I see it. It won't kill her." I try to assume that people aren't thinking or talking about me because why would they be? I'm not thinking or talking about them. That said, the other day someone made a somewhat passive aggressive Facebook complaint that my brain thought could've been directed at me and it has been bugging me all week whether or not I should be offended by it. I will preface the rest of this post by saying, I am good at Scrabble/Words with Friends. Scary good. My Scrabble Ap ELO Rating is 1572 which is over a hundred points higher than my next highest friend. I am not the best player by any means (I am being beaten handily by at least two players the random opponent system paired me with recently), but I win more than I loose and I consider any move worth less than 20 points a weak play. Recently I started playing someone I know in real life and I was beating them pretty good . . .pretty good as in I won by about 200 points. A little later that day I noticed they had a status update that said something like they hated it when people cheated in Words With Friends is it really possible to always score about 40 points on every word? My first thought was they were talking about me. After all, I was beating them. Hey! I don't cheat. I should say something. My second thought was, no, I'm good but I don't score that high every hand. My third thought was, I score pretty dang close to that though. My fourth thought was, no, I'm sure they play lots and lots of people. They couldn't be talking about me. I'm a nice person. Everyone knows I'm a nice person. I should say something commiserating with them about how people cheat just so they know I'm a nice person who doesn't approve of cheating. My fifth thought, yeah, but what if you do and they say something like, "I was talking about you, jerk!" No, they wouldn't do that. . . would they? Would we fight? Would I lose a friend? Have I already lost a friend because of perceived cheating? Should I stop playing quite so well? I didn't really have a sixth thought. I just kind of soothed myself down and told myself I was being an egomaniac for assuming they were referring to me. See, people, this is the problem with vague status updates! Anyone want to play Scrabble with me? I found you at the Military Spouse Blogging Community and following your blog now. I'd love to have you follow back at Reality Strikes Mommy. Please leave a comment so I'd know you dropped by. Thanks in advance! Ran into a "comments on this blog are restricted to team members" message when I tried. I'm not sure what that means, but it wouldn't let me post. I'll play Scrabble with you if you play Monopoly with me. I still don't understand how you can cheat at Scrabble.??? 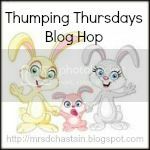 Thank you for stopping by the Thumping Thursdays blog hop and commenting on becoming a member of our community. I returned the favor and am following you back. I look forward to having you back.